I know there was a day when twelve years seemed a lifetime away. Today it just seems normal. I barely remember a time when it was just me. It's comfortable and fulfilling. Twelve years ago I married a most amazing man following a series of miraculous events. (One day I should share our story.) I've never looked back. It's not perfect because we're not, but I have been blessed beyond measure to be a part of his life and his ministry. I am so very thankful to the one who orders these steps! I am not a poetic person, so I have to borrow words from those who are. 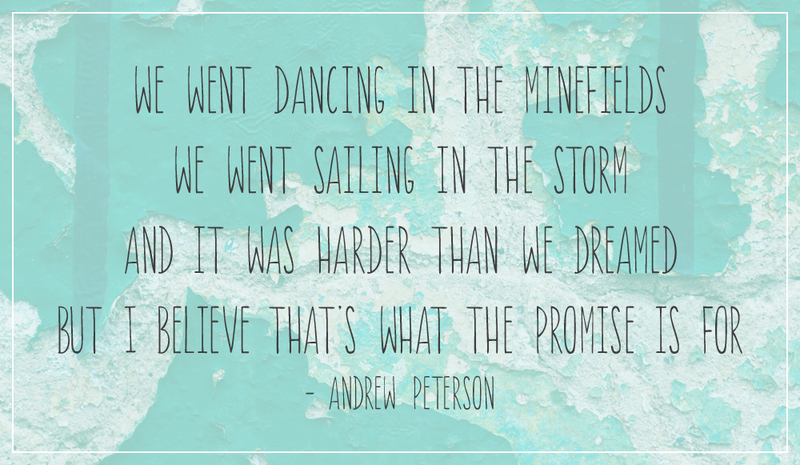 These words from Dancing in the Minefields by Andrew Peterson sum it all up well. I DO NOT do a great job of laying my own life down on a daily basis. Through, grace I think I have grown in this area throughout the past twelve years, but it's still a struggle against my sinful, selfish flesh. Marriage is a daily battle against what our hearts and the world are telling us, but a Christ-centered marriage can be more fulfilling than anything the world has to offer. Love is a daily commitment.